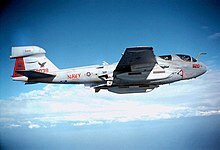 The Northrop Grumman (formerly Grumman) EA-6B Prowler is a twin-engine, mid-wing electronic warfare aircraft derived from the basic A-6 Intruder airframe. 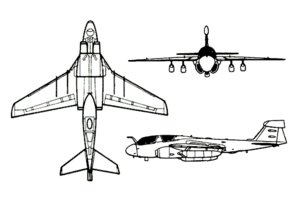 The EA-6B has been in service with the U.S. Armed Forces from 1971 through the present, during which it has carried out numerous missions for jamming enemy radar systems, and in gathering radio intelligence on those and other enemy air defense systems. In addition, the EA-6B is capable of carrying and firing anti-radiation missiles (ARM), such as the HARM missile. The aircrew of the EA-6B consists of one pilot and three Electronic Countermeasures Officers, though it is not uncommon for only 2 ECMOs to be used on missions. From the 1998 retirement of the United States Air Force EF-111 Raven electronic warfare aircraft, the EA-6B was the only dedicated electronic warfare plane available for missions by the U.S. Navy, the U.S. Marine Corps, and the U.S. Air Force until the fielding of the Navy's EA-18G Growler in 2009. Designed for carrier-based and advanced base operations, the EA-6B is a fully integrated electronic warfare system combining long-range, all-weather capabilities with advanced electronic countermeasures. A forward equipment bay and pod-shaped fairing on the vertical fin house the additional avionics equipment. It is now the primary electronic warfare aircraft for the U.S Navy, U.S. Marine Corps, and U.S. Air Force. The primary mission of the EA-6B is to support ground-attack strikes by disrupting enemy electromagnetic activity. As a secondary mission it can also gather tactical electronic intelligence within a combat zone, and another secondary mission is attacking enemy radar sites with anti-radiation missiles. The Prowler has a crew of four, a pilot and three Electronic Countermeasures Officers (known as ECMOs). Powered by two non-afterburning Pratt & Whitney J52-P-408A turbojet engines, it is capable of speeds of up to 590 miles per hour (950 km/h) with a range of 1,140 miles (1,840 km). Design particulars include the refueling probe being asymmetrical, appearing bent to the right. It contains an antenna near its root. The canopy has a shading of gold to protect the crew against the radio emissions that the electronic warfare equipment produces. Two EA-6B Prowlers over Turkey flying in support of Operation Northern Watch, 2002. An EA-6B patrols the skies over Bosnia and Herzegovina, 1995.